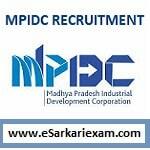 Eligible Candidates can Download MPIDC Assistant Call Letter at the Official Website of MPIDC/MP Online. Applicants First Open MP Online Official Website. Click on Download Admit Card for Assistant Grade I/II under MPIDC Link. Fill Application No. and DOB in Empty Fields and Click Login Button. Open and Download Admit Card. Take Printout of Call Letter.